I say ‘more’ because I tried it last summer. Bottling tomatoes is something that even the faintest-hearted cook must surely feel like doing if she lives here. The urge to capture some of the flavour of this lovely hot summer and impart it to winter meals is something I dearly want to do. Tomatoes in all their glory are everywhere, in the neighbours’ gardens, on their stalls in the markets, piled high on the backs of kamyons down at the beach. The price is rock-bottom right now: 75 kuruş per kilo – about 30p for 2.2 lbs. In the winter months the price will soar and we will be back to those uninspired little greenhouse numbers from Antalya. Even in Turkey those are hard and tasteless. Daughter No 2 and I, plus baby, have been going to the market regularly twice a week and buying these tomatoes in huge amounts. Sometimes she goes to get the car while I wait in the shade with the booty as all those kilos not only of tomatoes but other fresh fruit and veg are too heavy to carry. They are so juicy that that is the problem! My first load of 7 ½ kilos made a mere 9 jars!! And the last 2 were almost pure juice. Hmm I thought. Next time round, I boiled them quite vigourously so that the liquid would evaporate a bit. Better. But now I have received a great new tip from Lutfi and Beyhan at Biber Evi/Pepper House, a charming little boutique hotel here in Assos, where they bottle in massive quantities every summer. I asked Beyhan about this and she said what they do is literally squeeze the tomatoes before they chop them up and chuck them into the pan. I had of course been removing seeds and juice with a teaspoon but this was the business! Cut them in half and using your hand, squeeze with all your might, all the liquid plus seeds will come pouring out and you will be left with the pulp which is what you want. Last year I attempted bottling for the first time and enjoyed the process thoroughly but I wasn’t entirely happy with the sterilizing as some jars did not keep which was most disappointing. Again I set the oven to 100°C, washed the jars in warm soapy water, rinsed them and set them on an oven tray to dry out in the oven for 40 minutes. I synchronized the boiling of the tomatoes so that they were ready at the same time. 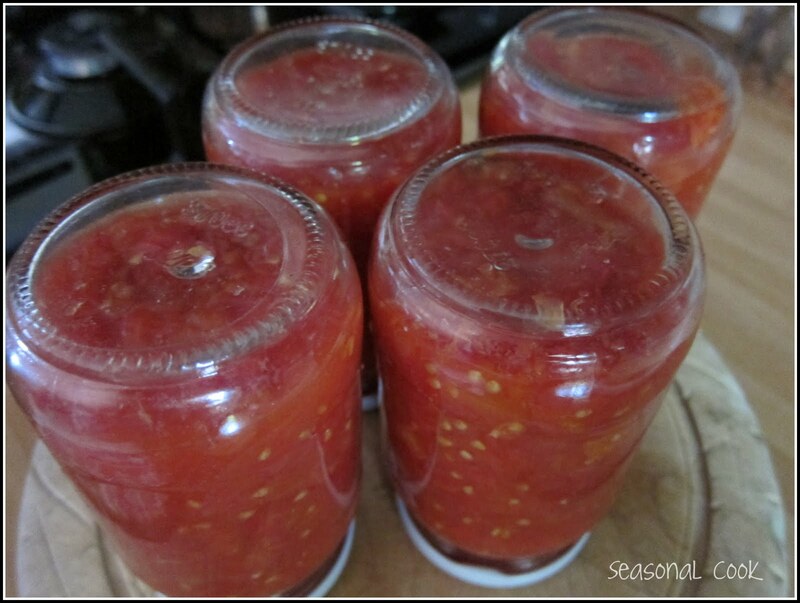 The trick is to fill the jars while hot, and tighten the lid immediately. The next part is the important part: keep the newly-filled jars upside-down till completely cold to complete the vacuum process. I have done this religiously. Each jar takes about 750 gr fresh tomatoes! Amazing! One jar is enough for one Turkish-style yemek or meal! I have bottled 30 jars so far and only have another 22 to go! There were 52 jars and lids in the box that Lutfi got me. Another Lutfi tip is to use the jamjar lids only once, which I will strictly do. · Wash, peel and cut the tomatoes in half. Squeeze out excess seeds and juice. Roughly chop and place in large saucepan. Add 2 tbsp salt and bring to the boil. Depending on the amount of liquid, keep on boiling till at least some has evaporated. 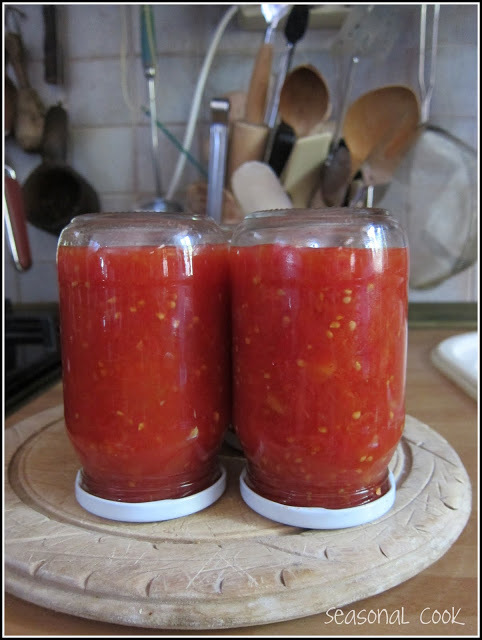 · Fill the hot jars with a spoon and put the lid on immediately. Tighten and place upside-down in a suitable place. Leave like that till completely cold. Store in a cool, dark place or even the fridge if space allows, till needed. 10 more kilos from today’s market! I will see this project through! Thanks for all the great tips Claudia. I have never tried to can tomatoes. I remember my mom and grandmother always canning all summer long. Such a wonderful thing to do. And you will have that wonderful summer taste all winter long. I've never canned tomatoes…I always make homemade pasta sauce and chili and then freeze it for the winter months when it's cooler and we feel like eating those heartier meals. Might just have to give a few jars a try. Glad you all like these tomatoes! thank you for your comments. I did another 10 kilos today – phew! Joy, do you think the dishwasher is hot enough? I guess it is… good to hear that you did those peppers – yes, garlic is the way forward!! I do love the way that you share your own tips and those you have picked up. 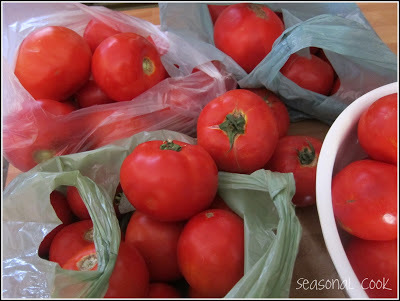 Most informative and looks like you will have plenty of tomatoes for the winter months. Thank you for the wonderful instructions, Claudia. Are you bottling any fruit this summer? I would love to conserve fruit this year, say, peaches. Elinize saglik! Hi Abby, thanks for that nice comment! Broken Fingers! Thanks for your comment too! No, tomatoes is my limit – at least for this summer! I managed 48 jars in the end so feel quite pleased with that. Just checked out your blog and see that in fact you haven't posted for a long time! But you are still here? Hello again, I finally got the chance to follow this recipe. It was very easy, thank you. 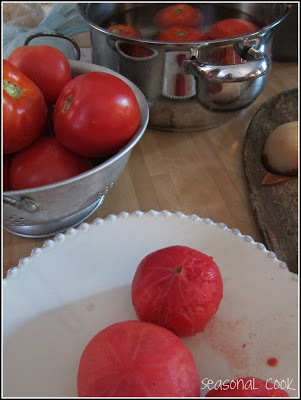 The one surprise was that I only got about 1 litre of conserve for about 4 kg of raw tomatoes. Might I have gotten rid of too much juice & seeds? Thanks again! Hi Broken Fingers! Will you see this, I wonder? Thanks for coming back to me and good to hear that you tried this recipe. I also was amazed at how many kilos were necessary to produce one jar!!! I think the more seeds and juice you get rid of, the better :)).